Happy holidays everyone! We would like to thank you all for another wonderful year full of creativity and fun – we appreciate each one of you for the support that made it possible! As we look forward to an even bigger and better 2015, Trompe Loeil wants to give our wonderful customers a little gift – our brand-new Winter Trees are FREE at the Mainstore until January 1! 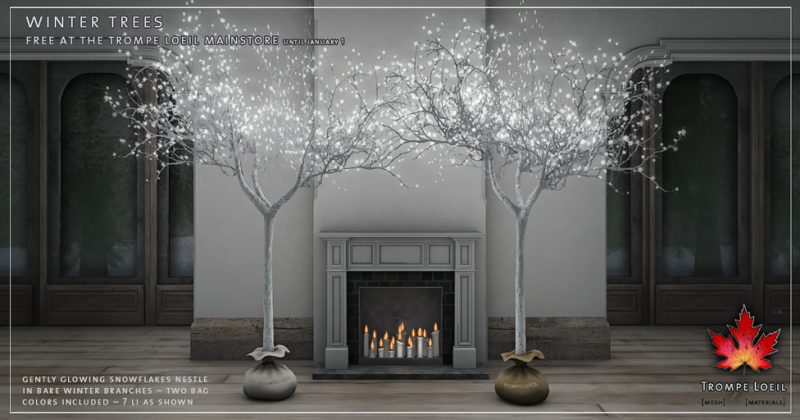 These white birch trees – bagged in white or brown burlap for easy, mess-free decorating – have captured softly glowing snowflakes in their bare branches. Use these indoors or out, all year long! 7LI each as shown, but shrink to 3LI for use in smaller spaces. Available in the main lobby of the Trompe Loeil Mainstore for free until January 1! Have a wonderful holiday and a fantastic New Year!